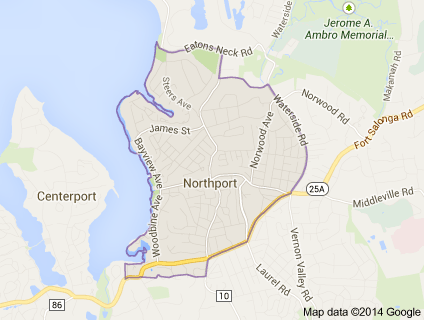 Northport, NY The original inhabitants of the area now known as Northport were the Matinecocks, one of 13 Native American tribes of Long Island. The Matinecocks called this land Opcathontyche, which meant "wading place creek". After Dutch interest a few years earlier, the land was sold by Chief Asharoken, head of the Matinecocks, to three Englishmen in 1656. With land that was well suited for farming, the early settlers grazed cattle on pastures around the harbor. The area soon became known as Great Cow Harbor. (The nearby hamlet of Centerport was known as Little Cow Harbor.) The oldest house still standing in Northport, the Skidmore House on Main Street, was built in 1761. In 2009 the house was put up for sale, sparking the village to pass a historical preservation law. Special thanks go to Chris, his website gateway2capecod.com looked so well put together that I asked his assistance, he could not of been more helpful, thank you Chris. Special thanks go to Kevin Reed at TNET Weather for his work on the original Carterlake templates, and his design for the common website PHP management.